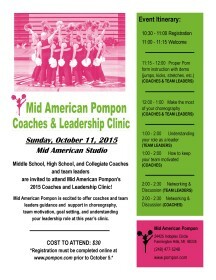 Pompon coaches are invited to the 2015 Mid American Pompon Coaches & Leaders Clinic. This informative event, led by Mid American Pompon Director Julie Hobbs Julian, will provide both new and veteran coaches with valuable information on how to run a successful pompon program. Middle School, High School, and Collegiate Coaches and team leaders are invited to attend Mid American Pompon’s 2015 Coaches and Leadership Clinic!